I felt this quote by Pissaro were the words to convey my feelings when thinking about Monet's work, especially this one, Gladioli. I have been writing about the landscape, the artist, modernity and industry, and this painting can be viewed as a culmination of all of these factors since, in a way, I feel it's Monet's reaction to industry, modernity and its effects on the landscape. I previously mentioned that modernity encompassed the new concept of leisure time and day-trippers going out to visit the country, as well as the factories and other signs of industrialization intruding into the landscape. In Gladioli, Monet paints a pleasure garden with the latest fashionable flowers in a circular bed in the middle of the picture. The flowers portrayed and the setup of the garden would all be very familiar to the contemporary viewers since the flowers were the kinds that were available to them and this was a popular garden designs of the time. The woman with a parasol in the background lets us know that this is a pleasure garden to stroll in and enjoy. All of the features of Monet's art can be found in this work. He has broken down each element of the painting with individual brush strokes. The flowers and the butterflies in the air have all been represented as dabs of color that come together and we perceive as a blooming flower garden. The sun is shining through the left side of the picture plane casting multicolored shadows on to the woman's path and illuminating the flowers in the bed while leaving the red flowering bushes in the back in shadow. The composition is setup so that we know where to enter the garden and which way to go, due to the path on the bottom left of the painting. It is a composition that surrounds us and guides our eye to go traveling around the path to finally to the circular flower bed right in the middle of the composition. 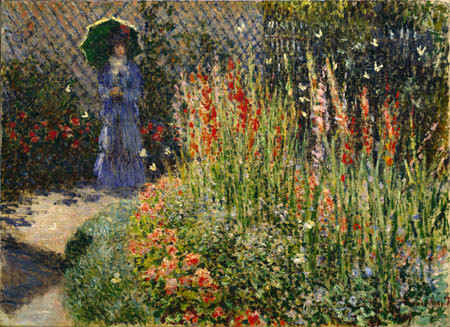 Gladioli is an artificially constructed scene of a transitory moment in Monet's Garden on a spring day in Argenteuil. Even though in Gladioli, we are not afforded an actual view of Argenteuil's streets with it's inhabitants going about their daily business, we still get a feeling for the time Monet lived in and the effects of light on our vision, as well as the concept of pleasure in the landscape.